I WAS STILL up in the wee hours of Friday morning when a news article online caught my attention. This is the Bonnie who became the first female photographer in The Star and survived the male-dominated Photo Room back in the early 90s; the same Bonnie with whom I earned my first front page byline along with her first front page photo byline on 27th June 1992; the same Bonnie who covered numerous assignments with me, including entertainment events involving local and Hong Kong celebrities. This is the Bonnie who kindly became the photographer for the weddings of my brother, two sisters and eventually mine as well. I was happy to read that she is finally having her first ever solo photo exhibition come 1 – 31 March at Traders Hotel, KL. Twenty four years of hard work that finally paid – a well-deserved recognition. Congrats Bonnie Yap! 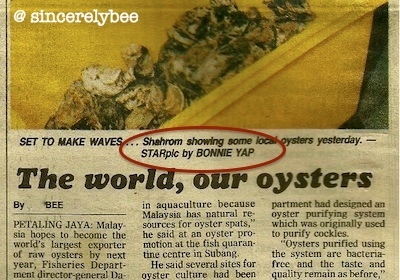 Our first front page byline together (The Star, 27 Jun 1992). (L-R) Bonnie and I out on assignment; Bonnie with the late Anita Mui; Bonnie at my wedding. Fond memories of our Star days between 1992-94. This entry was posted in Articles, Star Stint and tagged Articles, Friends, Star. Bookmark the permalink.